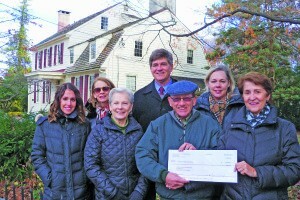 The community group that is working to establish a theatre and cultural center on the site of historic Boxwood Hall has received a $5,000 grant from the Haddonfield Foundation. Boxwood Arts will use the funds to establish and maintain its capital campaign database. Dave Stavetski, chair of the Boxwood Arts executive committee, said the group recognizes the importance of taking a comprehensive approach to the capital campaign. The Haddonfield Foundation has a long track-record of providing financial support to fledgling projects and organizations. Among the best-known are Haddonfield Child Care, Interfaith Caregivers, and the Farmers’ Market.